14 Şubat 2019 Perşembe 13:02 - 4 reads. The Swiss labour market continues to benefit from the good economy. Thus, the number of employees has increased to make in the fourth quarter of 2018. The increase is due to the foreign labour force, whereas in the case of the Swiss a slight decline. Overall, the number of employed increased in the fourth quarter of 2018 compared to the corresponding quarter of the previous year by 0.8 percent to 5,086 million people. 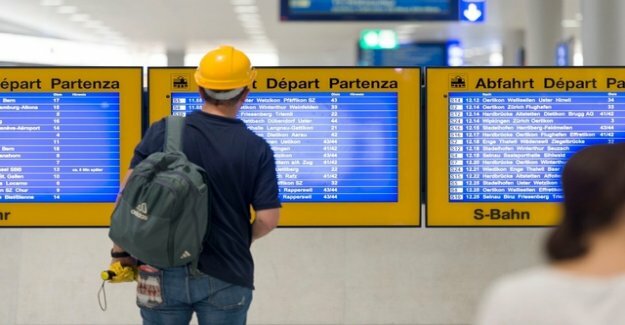 The number of foreign workers increased in the year-on-year by 2.9 percent, while those of the Swiss employment declined by 0.1 per cent. This is the Federal office for statistics (BFS) announced on Thursday in the framework of the publication of the Swiss labour force survey (SAKE). Among the foreign workers, the increase in the number of persons with a residence permit (permit B or L, for at least twelve months in Switzerland) to the most (4.9 percent). gender-sorted, an increase of 0.7 percent for men overall, while the women, even an increase of 1.1 percent was recorded. On full basis expected, so in the so-called full-time equivalents, amounted to the increase in both men as well as women 0.7 percent. Between the third and the fourth quarter of 2018, the number of employed persons increased adjusted down, as in full-time equivalents, but only slightly, by 0.1 percent. In the reporting quarter, 227'000 people were increased in Switzerland, as per Definition of the International labour office (ILO) unemployed. These are about 4'000 more than one year previously. The share of the unemployed in the labour force was 4.6 per cent compared to the third quarter of 2018, 0.2 percentage points higher. In the previous year, the unemployment rate was 4.5 percent. The unemployment rate of the BFS is known to be significantly higher than those from the state Secretariat for economic Affairs (Seco), unemployment rate, calculated only the registered unemployed are included. This was most recently (January) at 2.8 percent.